How to do business in the Doughnut Economy? Inequality and deprivation at one edge and the Earth’s environmental boundaries at the other. The lower and upper boundaries of a reframed economy are visualized in a doughnut. Kate Raworth’s internationally acclaimed idea has been praised by many sustainable businesses, politicians, activists, thinkers and influencers. She says that an economy that only strives for growth is not appropriate or just in the 21st century. A social lower limit (social foundation) and ecological upper limit (environmental ceiling) are necessary to create a sustainable economy in which every citizen can be guaranteed a minimum level of prosperity. The doughnut model frames an ‘ecologically safe and socially just space’ in which humanity should strive. On January 5th, Ondernemers van Nu and Heroes and Friends organized a special event, where Kate Raworth and Willem Ferwerda spoke about society’s addiction to growth and how this addiction will destroy any hope for a prosperous future. Basically, how can we do business in the doughnut economy? Kate begins by quoting Buckminster Fuller: “You never change things by fighting the existing reality. To change something, build a new model that makes the existing model obsolete.” She explains that it does not always have to be a new model, in practice it might be a new business or a new picture. “Pictures are incredibly powerful, they go into our minds and sit in the visual cortex for decades, long after the words and equations have faded.” The doughnut illustration is a perfect example of a new model brought to life as a visual representation of her new economic theory. After giving a short introduction as to why we need to address our hunger for growth, Kate prompts the audience to consider: “what does human wellbeing depend upon?” Enthusiastic responses ensue like love, health, food, education, connections etc. Kate smiles and says we are all right. But first and foremost, in order to achieve all these human rights, we need to value our planet and its resources. We must stop being parasitic and work in a symbiotic relationship with our planet: we can’t have one without the other. “If we want food, we need a stable climate and fertile soil. If we want health, we need an ozone layer. If we want fresh water, we need healthy oceans and lakes. These two things are deeply intertwined.” This is how Kate’s doughnut theory came to life. “The only doughnut that’s actually good for us,” as she says. Willem Ferwerda explains that Commonland’s 4 returns approach beautifully fits this ‘benefits’ system approach. He has spent recent years developing a language that both economists and ecologists can understand. Commonland’s 4 returns – 3 zones – 20 years framework for ecosystem restoration aims to provide practical and demonstrable steps to make the transition towards an economy that is based on the restoration of natural and productive landscapes, instead of their further degradation. Whilst restoring the natural capital to the landscape, you will also enable other returns – or benefits – like social, financial and inspirational capital. At the end of the presentation, a logical question is posed: “If it is such common sense, what is holding us back?” Willem explains that, yes, for us it might be common sense, but unfortunately there is a lot of ‘uncommon sense’ pushed by governments, companies and other influencers, that almost makes it impossible for farmers and land managers to make a proper transition. Willem develops this further: “Ecology means [an] understanding of the household, [and] economics means household management. Currently, economics has been brought up to the level of ‘how do I manage the nation?’ Kate adds that we need to take it one level further to ‘how do we manage the planetary household?’ At the heart of economic education, taught to the vast majority of students worldwide, that in turn moulds our government’s economic policies, is to manage the household without apparently even understanding it. So, you can get an entire economics degree, without understanding anything about how the living world works”. This means that most of the ecological disasters that we are currently facing are, in economic language, explained only as externalities. They are consequences of our production and consumption markets but the costs are not valued or compensated as they are outside of the existing economic model to which we all work. 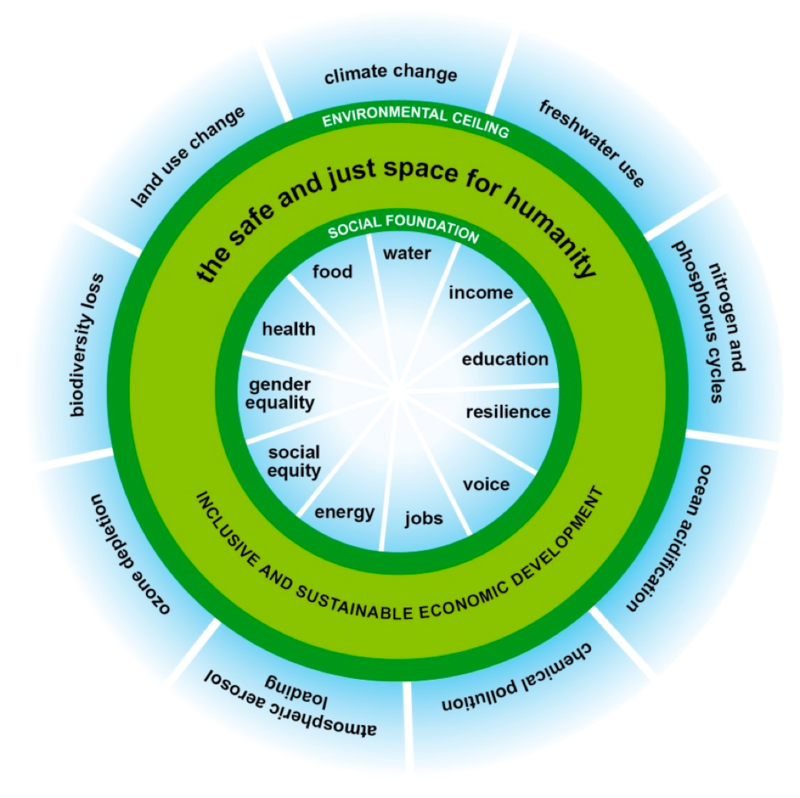 These externalities should be central in our economic system; a doughnut economics model.